Few coins have such an exciting and interesting history that the story even appeals to people with little interest in collecting coins. One of those few coins is undoubtedly the 1883 Liberty Nickel. Representing the first year of issue for the series, the coins were struck in two different varieties, “without cents” and “with cents.” The two varieties were created as a direct result of the public reception of the new design. Under the Coinage Act of 1792, the Mint had previously struck five cent coins referred to as half dimes with a silver based composition. However, with the rising price of silver and the small size of the half dime, a substitute was favored. The new five cent denomination was introduced in 1866 as the Shield Nickel. These coins carried a composition of 75% copper and 25% nickel and would briefly be struck along side the half dime until 1873. After this date, only the nickel five cent piece was produced. 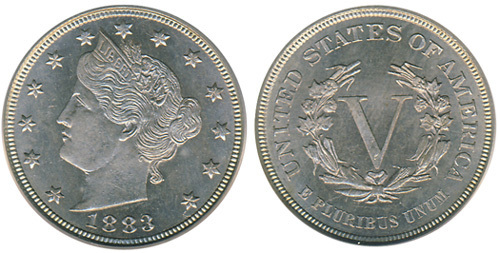 The Liberty Nickel design by Charles E. Barber was the second type for the nickel five-cent denomination. the obverse design features the head of Liberty, facing left with thirteen stars around. The reverse featured a wreath, with the Roman numeral V within, representing the denomination. E PLURIBUS UNUM, the motto (meaning “out of many one”) is below the wreath, while UNITED STATES OF AMERICA is above. The final design was the result of a number of test pieces (patterns) that were made of various designs and alloys in 1882, which included the design would be introduced in the following year. Except for the Roman numeral, no further indication of the denomination was given on either the 1882 pattern or the regular issue coins struck in 1883. As early as March 1883, newspaper articles began to appear calling for the addition of the word “cents” to the reverse of the coins. This would eliminate the problem of gold-plating the new V-nickels and passing them off as coins of a much higher value. Before the new hubs and dies were ready, however, a large number of 1883 Without Cents Nickels were already released in circulation and people were told to be careful when accepting five dollar gold pieces in commerce. Over time the story of the “Racketeer Nickels” grew and this perhaps explains the popularity of this issue, although few (if any) genuine racketeer nickels survive up to this day. Stories that have appeared in numismatic magazines include that of a Josh Tatum, a deaf mute who is said to have made at least $15,000 by passing gold-plated and reeded nickels as five dollar gold pieces while buying a cigar (five cents at the time). This story, however, is not supported by much evidence, and appears to be the result of 1960’s numismatic folklore, when it seems to have appeared for the first time. Despite the fact that the Mint struck the 1883 Liberty Nickel “without Cents” variety for only a limited under of months, the output was reasonably large, with 5,474,300 coins struck for circulation, and 5,219 coins struck in Proof format for collectors. This high production may indicate that the Mint wanted to use the dies on hand before using the new dies reflecting the change to the reverse design. A newspaper article, mentioning that approximately 1.2 million of the new nickels had been released by mid-March 1883, appears to support this statement. The “with cents” variety, however, has an even larger mintage, with 16,026,200 pieces struck for circulation and 6,783 Proofs for collectors. A much smaller quantity of the With Cents variety have been graded by the major certification services. While this is a slightly more difficult coin to find in uncirculated condition, it can hardly be considered a scarce coin. It is also slightly less popular, as it is not a one-year type coin, and does not have the special story to tell that the earlier type has. As such, it is very affordable and like the without cents nickel of 1883 always available. The finest circulation strikes of the 1883 Liberty Nickel “Without Cents” variety are graded MS67. This includes fifteen pieces graded by PCGS and more than fifty graded by NGC at this level. These are often very mark-free, although the hard nickel alloy brought up many striking issues. As such, few examples of this particular type boast needle-sharp surfaces, a problem which persisted later on in the series. The highest price realized for this issue was $4,888 in a July 2008 auction. Proof examples of the same issue are numerous as well and generally in strong demand for proof set purposes. The finest PCGS graded example is a single PR67DCAM, along with eleven in PR67CAM and four coins graded PR67. NGC has graded two coins in PR67UCAM, seventeen in PR67CAM and 20 in PR67. The highest auction price was $13,800 for a NCG PR67UCAM in May 2005. 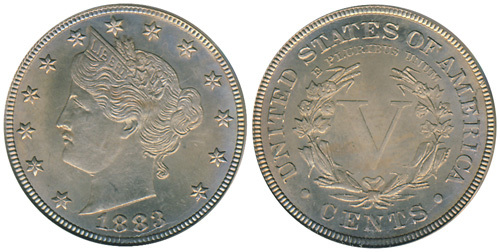 As for the 1883 Liberty Nickel “With Cents”, there are fewer pieces certified in total, with the finest graded MS67 by PCGS followed by more than fifty examples graded MS66. At NGC, there are four examples graded MS67. Of the circulation strikes, the highest price realized at auction was an amazing $34,500 for the sole PCGS MS-67 from the Dale Friend collection, sold in March 2006. As for the Proofs, PCGS has graded two in PR65DCAM, one in PR67CAM and four in PR67. Examples with any Cameo contrast are much scarcer of this issue than of the Without Cents issue of the same year. NGC has graded a single PR67UCAM, one in PR68CAM and eleven pieces in PR67. The highest auction price realized for this issue in Proof was $10,925 for a NGC PR-67CA in January 2007.